If you ever ask me that what is my favorite wooden pallet repurposed furniture item? 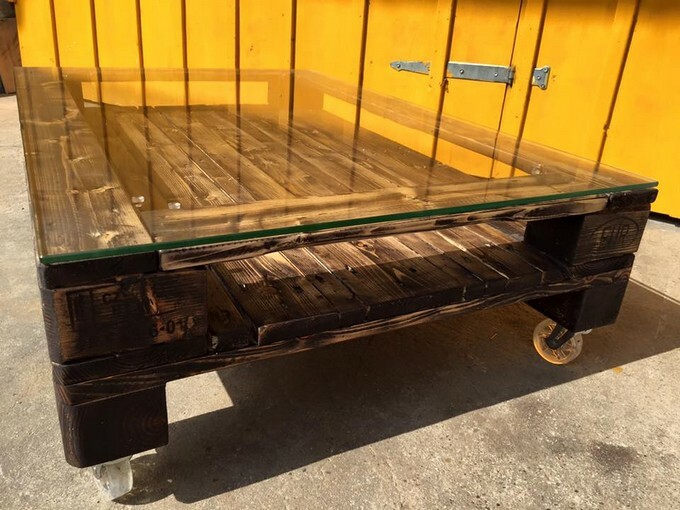 Then I would instantly answer that this is a wood pallet repurposed coffee table. 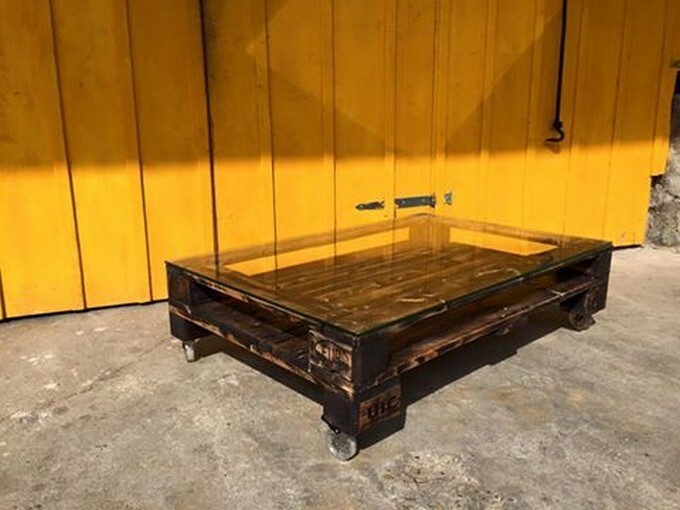 It has got so many potential reasons as it takes less time to recycle, this is accepted easily everywhere infact direly needed, it takes less timber, plus you can make several experiments on the design and shape of the wood pallet coffee table. 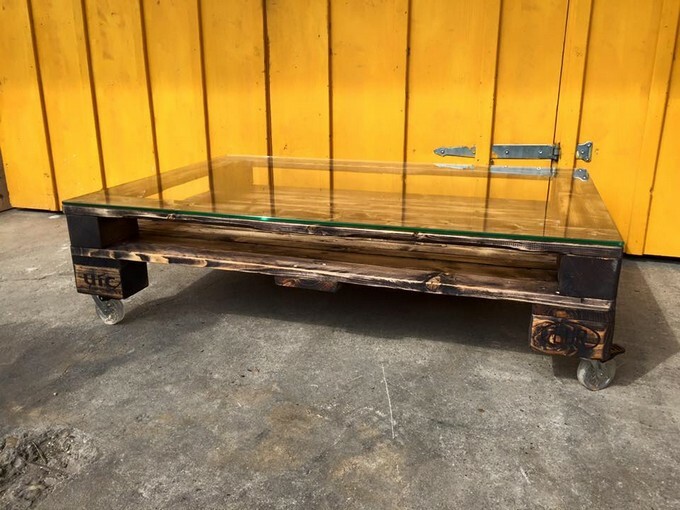 Here we bring a specific wood pallet coffee table with the glass top. The glass top is introduced intentionally, just to bring about some change in the wooden creations. 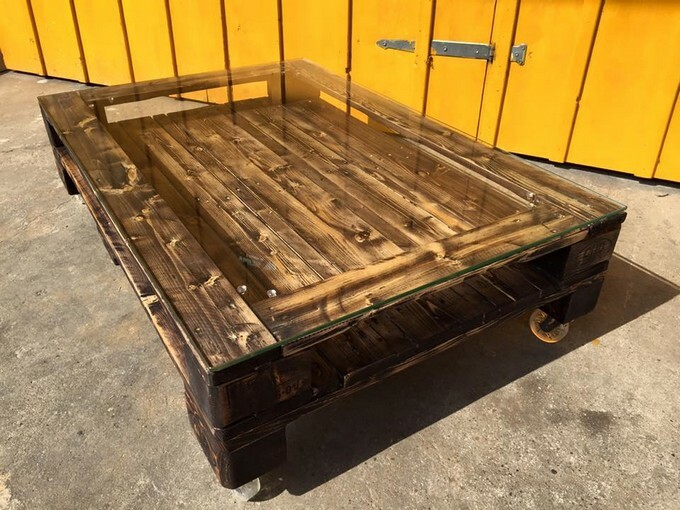 First of all have a frontal look of the said wood pallet coffee table with the glass top. The very first thing that is prominent in this wooden beauty is the crazy stain of the coffee table. We actually left it in its natural shade. So the table has got all the stains which were sustained by the shipping pallets in their entire course of life. Now talk a bit about the metallic wheels that we have fixed on the base. This would make it easy for us to drag the table just with a gentle push single handedly at our desired place. And lastly we must talk about the clean and transparent glass sheet that we have placed on the top. A thick glass top is used here that is dominating literally the rest of the table structure. This glass top is used with the intention to bring a decent touch. This has now turned into an ideal wooden furniture item that can be placed anywhere inside the room whether it be the lounge or the drawing room. This is just a perfect substitute to the market oriented furniture items, and would not bother your finances at all.